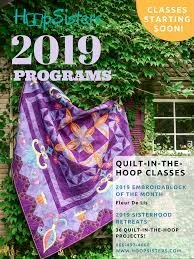 Hoop Sisters block of the month for 2019 is here. Join us for a 12-month journey to make this beautiful embroidered quilt. You can purchase the 12-month program for a one time cost of $ 189.99 or a monthly charge of $ 29.99 . We will start on March 16 and you will pick up the current block designs on the 3rd Saturday of the month for a period of 12 months. We will print out the book for you, but you will have to supply your own notebook. There will be a 1-hour lecture/demo with a video. If you want to stay and sew one of the blocks of the current month, there will be a sit-n-sew time after the demo. Signing up for this class also allows you to attend the Sisterhood retreat classes.